Go to this Profile, You will find two dots. Copy the dots to your profile first and last name. Now from each field delete one dot. Now your profile will become invisible in community posts. Note that the DP will show up in community posts. Everywhere else it will look invisible. This will make your community invisible as well as non-clickable. You can make a post with non-clickable link where others would not be able to see or click on the topics (except if someone is using scripts to view the last post). Then on the Subject field and message field do this: click on the field and press and hold down alt key and then type 0173 from the Numpad of the keyboard! Then release the alt key. Repeat the procedure for both the fields. The tricks are same as above. This is a little bit tricky. Follow these instruction and refer to the screenshots for more help. 1. 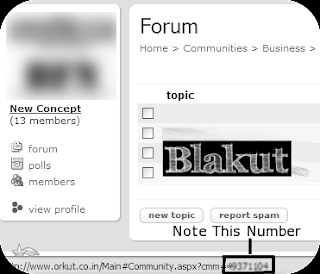 First select the blank scrap or Community post along with the profile name and then Right Click and select "View selection Source". 2. Now a new window will open. You can find the hidden message after the line div class="para" as shown in the image below. This is the most trickiest part. But not something which you cant do! So have patience and follow these instructions very carefully. 1. Select the profile along with the invisible topic as shown in this picture. 2. Right click and chose View Selection Source as mentioned previously. A new window will pop-up. 3. Now note the number after this line a href="/Main#CommMsgs.aspx?cmm=***&tid= as shown in the image below. 4. Now you need to note down the community number. You can do this easily by hovering your mouse over the community name and noting down the community id from the link shown in the status bar. See this screenshot for reference. 5. In the link below replace "xxxxxx" with the community number you have noted in step 4 and "yyyyyy" by the topic number you have noted in step 3. Now just copy paste the modified code in the address bar of your Browser and you will be on the hidden thread. Now you have enough knowledge for being invisible in orkut while making others visible! Enjoy and as usual.